Flexible and powerful, SkyNet network video solutions enable you to remotely and cost-effectively monitor and secure people, property and industrial processes. You can use it to conduct remote education or troubleshooting, or broadcast sights and sounds on a Web site. Your network video system can be as simple or as sophisticated as you want it to be. IP networks are flexible, powerful and advantageous, and they are the key to providing you with wide ranging possibilities in system design, applications and solutions. Simply connect a SkyNet network camera (or video server that is attached to an analog camera) directly to a computer network by wired or wireless means, and you'll have access to live video streams directly from your desktop with the use of a standard Web browser on a local area network or from any location in the world via the Internet. But IP networks, in conjunction with SkyNet network video solutions, can offer much more. Image quality: Image quality is one of the key aspects of SkyNet network video products, which have continued to set the standard in the industry. In addition to developing image processing chips and sophisticated algorithms tailored for network camera applications, SkyNet also provides a range of video compression standards (Motion JPEG, MPEG-4, MPEG-2) for users to choose from. In many network video products, both Motion JPEG and MPEG-4 are supported simultaneously. This enables you, for example, to view at full frame rate with MPEG-4 and record at the same time with Motion JPEG, allowing for optimization in image quality and bandwidth. Wide ranging network video products: You can find fixed network cameras for both indoor and outdoor applications, as well as pan/tilt/zoom and network dome cameras that enable remote control of pan, tilt and zoom functions over IP networks. SkyNet also offers video servers that help analog CCTV systems take advantage of the benefits of a digital, networked world. Video management software and accessories such as network camera housings and devices that bridge between analog and digital, are also available. 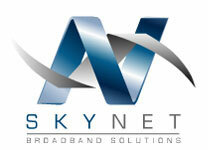 Besides visually being able to see remotely from any networked computer, anywhere and at any time, SkyNet also provides products that enable two-way audio communication over networks. This allows you to not only hear what's going on remotely, but also speak through the network. With both visual and audio communication, you can question intruders, conduct remote education, troubleshooting, or broadcast both sights and sounds of a location or event on Web sites. SkyNet network video products enable users to set and manage alarm events. Once an alarm is set, either as scheduled, or via input/outputs, video motion or audio detection, you can automatically request that certain actions be performed; for instance, start sending and recording images to specified destinations, send alerts to specific individuals via e-mail or SMS to a mobile telephone, activate lights, turn alarm on or off, open or lock doors, control temperature levels etc. A wide range of triggering mechanisms (whether built into the product or available in a software package) can be incorporated into an SkyNet network video system. You may schedule a time for the network video product to perform certain actions; e.g. start sending and recording images every evening, on weekends or on holidays. Many SkyNet network cameras and video servers have input/output ports that can be connected to doorbells, detectors (e.g. smoke, movement, sound, temperature sensors), lights, switches and alarm relays. When input mechanisms are triggered, you can automatically request that certain actions be performed. This feature essentially allows you to define areas of a screen where you want to detect any visual changes. When a change is detected, you may request a number of things to be done automatically. This feature allows you to set the level of noise that would trigger the performance of certain actions. You can set up the network video system to save the video data to a file server at a local or distant location for security reasons and at certain time intervals, or when motion is detected, for later viewing and analysis. Images can be uploaded via e-mail, FTP or HTTP. For easier management of video recording, storage and viewing, video management software from SkyNet and its Application Development Partners are available. With a network video solution, you have the option of using the same Ethernet cable both for data communications as well as power. This feature makes it easier to install products since an electrician is not required and the network video product is able to operate even when there is a power failure. SkyNet network video products provide many security features; among them, different levels of password protected access to the products. For example, using predefined passwords, certain people may only have the rights to view live images with no access to the product's configuration, while the administrator would have full access to configure the product's settings and security features. Another security feature is IP address filtering, which allows only predefined IP addresses to access the product. Some SkyNet products also provide HTTPS for encrypted communication.